Gold and Copper (Tala va Mes, 2011) is an Iranian film directed by Homayoun Assadian about a young married couple that must come to terms with a devastating personal tragedy. What distinguishes this particular work above others of its kind is the modern religious setting and perspective in which the story is told. However, depending on your interpretations in this area, some of you may have different reactions to the film. The film is well made, with excellent camera work, editing, and fine performances. The story proceeds through four phases, with the last act reaching a kind of problematic mental resolution that I will discuss below. 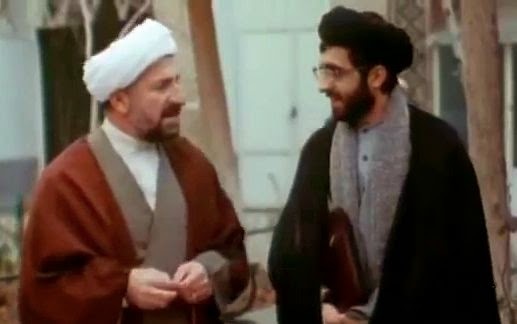 The beginning of the film shows Seyyed Reza (played by Behrouz Shaibi), a young seminarian from Nishapur who has come to Tehran with his family to pursue advanced studies in theology under an eminent scholar. He is accompanied by his wife, Zahra Sadat Moein (Negar Javaherian), and two young children – Atefeh, who is about seven years old, and Amir Ali, who is about one year old. 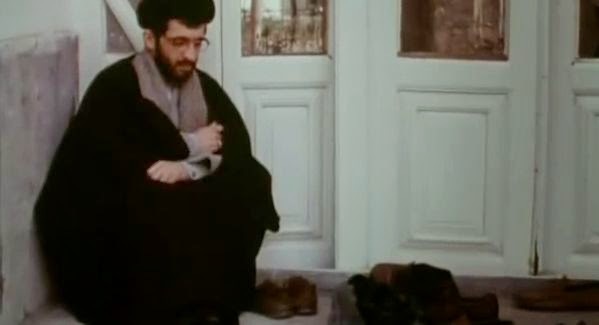 His title/name of “Seyyed” indicates that he is a descendent of the Prophet Muhammad, which gives him special distinction and allows him to wear a black amameh (turban), while all other mullahs and seminarians must wear white amamehs. At the Tehran seminary he is welcomed as a promising scholar who has been a high achiever at his earlier schools. When he is offered the opportunity to teach lower-level classes, he declines, saying that he wants to devote all his time to his studies. When the family moves into their small apartment, Seyyed is troubled to observe that his hoped-for serene study environment may not be so quiet. His elderly next door neighbour, Ms Azam, lives with her grownup grandchild, Aida, who has Down’s Syndrome and has the habit of playing loud music on her “boombox” portable audio player. He commutes each day to the seminary with his friend and fellow seminary student, Hamid, who owns a pickup truck and supports himself by working as a free-lance “taxi trucker” (a common pursuit in Iranian big cities). The contrast between the two is marked: Hamid is earthy and jocular while Seyyed is introverted and sensitive. When they are driving in his truck, Hamid pleads with Seyyed to remove his amameh, because his clerical appearance will presumably scare away potential customers – thereby alluding to the common apprehension that the mullahs interfere with the normal lives of the citizenry. Seyyed Reza’s home life is idyllic. His wife Zahra is attractive, attentive, and totally devoted to her family. She also supports the family by spending time hand-weaving carpets at a loom in their apartment. However, she starts suffering from episodes of double-vision, and then she finally collapses at home. She is rushed to the hospital and held their for tests to be undertaken. 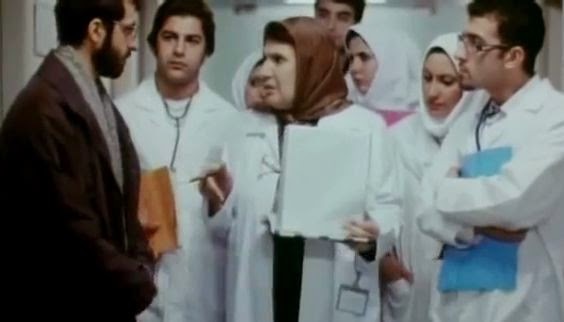 At the hospital a nurse named Sepideh looks scornfully at Seyyed’s clerical garments and ridicules him for probably having neglected his wife and not even having the guts to look her in the eye when they converse. She derisively refers to him as an “akhund”, an old term for a mullah that modernists now often use to describe meddlesome, backward-thinking clergy. The next day Seyyed learns from a rather detached, almost unfeeling, doctor that Zahra is probably suffering from multiple sclerosis (MS) a terminal degenerative disease that can lead to total paralysis. 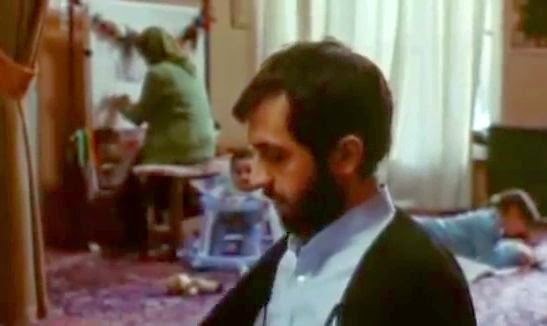 Seyyed is stunned by this news of his wife’s incurable condition and says to himself, “what will become of us?” He now has to look after the two kids at home, a task for which he is totally unprepared. He also has to take up the carpet-weaving work that Zahra had done. Periodically he looks out of his window at the next door apartment and wonders what Ms. Azam’s life is like looking after her care-needy granddaughter. “isn’t it normal? To whatever God told me, I said, ‘alright’. And whatever I tell God, God doesn’t say ‘no’”. He was just a simple rural man with no studies in philosophy. No knowledge of esoterism, nor a dervish of extreme austerity. He just had done honestly everything he knew. This is an example of some of the religious philosophy that underpins the story, and I will call this Sermon #1. Here the lesson is for people not to engage in deep philosophical speculation; just do as you are told. Zahra is brought home, but she is crippled and miserable. Crying out, she asks God to kill her so that she die with dignity. Seyyed merely cautions her not to speak like that, because she will anger God. After more of Zahra’s crying, Seyyed finally blows up at her. He complains that her illness has interfered with his precious studies, “and you just whine”, he says. They do later make up, after Zahra apologises. Gradually, though, Seyyed seems to be becoming more down-to-earth in connection with his interactions with Aida and others around him. Later while Zahra is out walking on crutches, the haughty nurse Sepideh pays a personal visit to Seyyed. She had had some personal conversations with Zahra in the hospital and was emotionally affected by Zahra’s deteriorating condition. 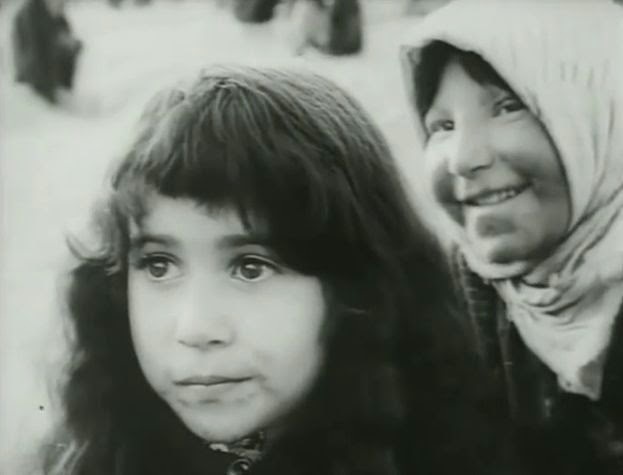 In particular, Sepideh was moved by Zahra’s belief that “there is happiness in appreciating the small things”. Before departing, Sepideh somewhat presumptiously instructs Seyyed to tell his wife that he loves her. Back home, Zahra bravely suggests to Seyyed that the two kids will need a new mother to look after them. To her surprise and alarm, Seyyed answers that he has been thinking along the same lines. When he detects her misgivings, Seyyed accuses her of being willing to leave him all alone to look after things. Zahra acquiesces and can only glumly hope that the new wife will not be too glamorous. Seyyed has been diligently working on a hand-woven carpet that he has been contracted to supply. 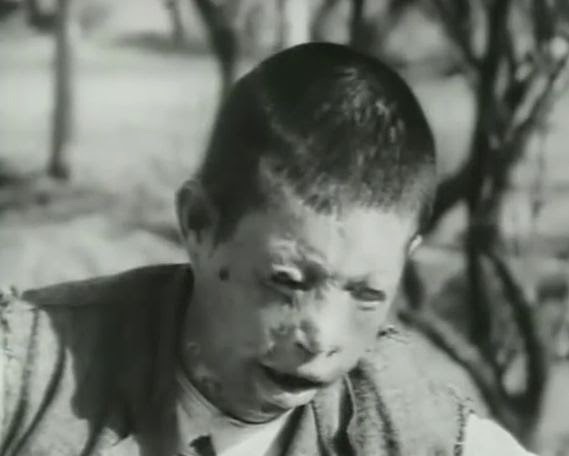 But he has trouble completing the task because of a worsening blurring condition in his own eyes. He delivers the carpet, but tells his contractor that he cannot continue with this kind of work for awhile. He now has his own seriously deteriorating health problem to deal with. So he decides to get away from it all for a bit and enlists Hamid to take his family to the countryside for a picnic. On the outing Zahra invites Seyyed to read to her from the Quran like he used to. He obligingly picks up the Quran and, pretending to read what he cannot see because of his now blurred vision, apparently recites some lines from memory. Then he tells her what Sepideh had instructed him to say: that he loves her. For a long time everyone has been looking for a key to heaven, a treasure or elixir. They are searching for the secret to happiness in the wrong place. . . . The whole story can be summed up in one word [phrase]: call it a “key” or a “code”. . . . The Great God told Moses this code in one word. : Love for My sake, Hate for My sake. When saying that the code for acceptance of all works is Velayat [the authority invested in the Prophet and the Ahl al-Bayt (his ordained representatives, such as the Imams)], it means that this loving is for God’s sake. It means whoever God loves, you love them, too. It means loving because of God, growing affection for God’s sake. Not for superficial beauties, not even for your own heart. Just for God! . . . The more hardship you take for God, the higher your spiritual rank. One might first think that the overall message of the film is just to love no matter what. But I will argue here that love (at least the way I think of it ) is not the focus. Assadian may have intended to have the film's principal message be love, but that is not what comes across. Seyyed is an honest, well-meaning, and gentle soul, but he is not filled with love. He is benign and dutiful, but detached. We never get the feeling that he truly loves Zahra and deeply feels for her. He is more concerned with how things affect himself. Even at the end of the film when he tells Zahra that he loves her, he seems to be saying this because he should say it, not because it comes from his heart. Further evidence that the film's answer and main theme is not just love is given in Sermon #2, when the lecturer intones that the special code is “Love for My Sake, Hate for My Sake”. Hate has equal place with love in that phrase. No, the real message of the film seems to be that one should act according to how one has been instructed to act by the religious authorities. Follow the basic rules, and don't try to make your own interpretations of the sacred texts. Don’t engage in abstract philosophical speculation (Sermon #1), and also don’t consult your own heart (Sermon #2: “not even for your own heart.”). Just do as you are told. Thus “Love for My Sake, Hate for My Sake” does not mean to embrace all with love; it means to love and hate according to instructions. The more you do that, the more points will be added to your score and the higher will be your "spiritual rank". Admittedly, this idea of submission to religious authority is common to many religions and has its attractions for many people around the world [2,3]. 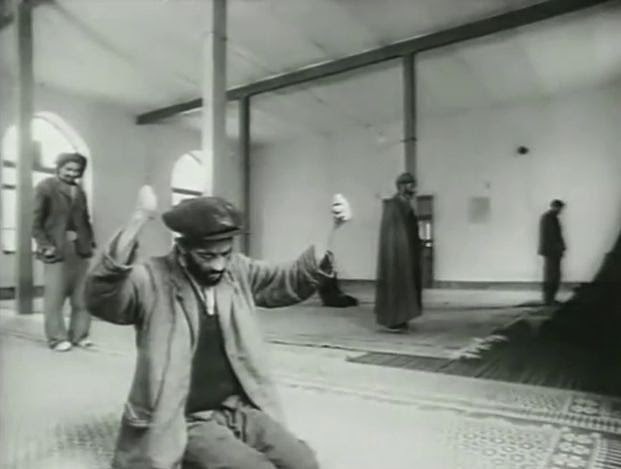 At the end of the film, Seyyed is shown to be servilely arranging the sandals that have been left outside the lecture room. He is showing his submission. The film’s title refers to the medieval notion that alchemy could be used to magically transform copper into gold if one used the proper elixir. In Sermon #2 reference is made to the idea that the code is like a magical elixir that can metaphorically transform a dusty face into gold. But how in the larger human context should we take the idea of gold and copper? Gold is all glitter and decorative; but because it is a "noble metal" that doesn't interact with other materials, it stands apart. Copper is the opposite – its properties make it usefully part of our human engagement with the world. Seyyed was seen by everyone to be headed in the direction of gold, a treasure. He is striving for his own spiritual perfection, but he is detached. On the other hand, Zahra (brilliantly portrayed by Negar Javaherian) was compassionately engaged with her family and the world. She was evidently seen as copper. She served and loved with all her heart in whatever she did. Gold and copper: which one do you prefer? One might invoke the abstract love notion of agape, but I will not go into that here. Mark Lilla, “Slouching Towards Mecca”, The New York Review of Books, 1 April 2015. Michel Houellebecq, Soumission, (2015), Paris: Flammarion. The story of Devdas, based on the novella Devdas by Bengali writer Sharat Chandra Chattopadhya (1876-1938), has been a popular romantic narrative for the Indian people ever since its publication in 1917 (though the story was apparently composed in 1901 ). Just why this tale lingers in the popular mind may be a matter for discussion, but its persistence is undeniable: the story has been filmed at least sixteen times in various languages on the Indian subcontinent – and this doesn’t even count popular variations on its themes, such as Kaagaz Ke Phool (1959). 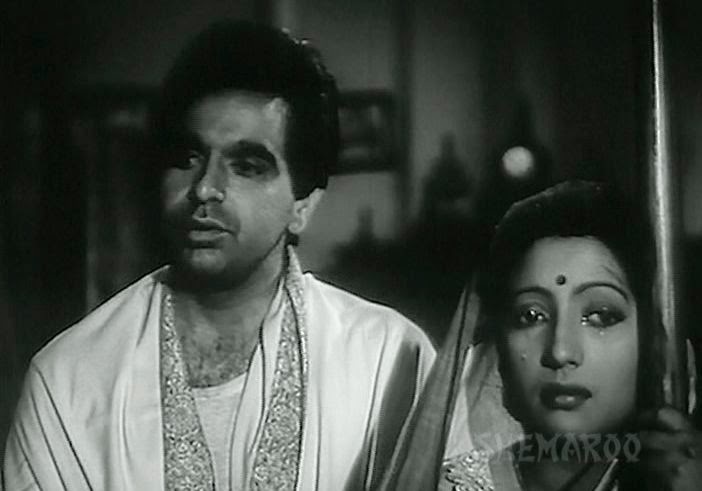 Among all those productions of Devdas, however, probably the most well known is the 1955 version directed by Bimal Roy (who had been the cinematographer for an earlier 1936 production directed by Pramathesh Barua). The basic plot outline is essentially a modern (circa 1900, anyway) tragedy in which a combination of societal restrictions and the protagonist’s characterological flaws lead to ruin. Viewers may place different weights on those two factors, but to me the primary problem is the latter one – the selfish character of Devdas, himself. His hesitancy and relational dishonesty are responsible for his downfall. Indeed a single missed opportunity that cannot be recovered is the main tragic theme of the story, and much of the film wallows in the despair induced by missing that opportunity. For some viewers Devdas’s lengthy self-pitying may be unbearable, but others may partly identify with him and appreciate the melancholy that the film induces. So it is not surprising that a key to how much one appreciates this film turns on the performance of Dilip Kumar in the role of Devdas. I will discuss that issue later on. Of course, this being a large-scale Bollywood studio production, the film features some comic relief and a number of lilting and romantic songs, all composed by Sachin Dev Burman and dubbed by professional playback singers. By here not dwelling on this music, I do not mean in any way to downplay its importance. The music probably constitutes this film’s greatest virtue. The story of the film passes through four stages, or theatrical acts, covering the life of Devdas. The opening scenes show Devdas Mukherjee and his playmate Parvita (aka Paro) as naughty young children of relatively well-off, upper-caste families living in a provincial town. Devdas, perhaps an early teenager, is particularly obstreperous and resists the authority of his schoolteachers, which only makes his younger friend Paro admire him all the more. At one point we get a view of the boy’s high-handed attitude while he is hiding away from the grownups in a grove on his family’s estate. Paro finds him there and joyfully converses with him; but when she doesn’t obey one of his commands, he rudely slaps her on the face and makes her cry. These two soul-mates soon make up, though, and they go out to the grove again and sing a beautiful song (dubbed, of course) to the wild birds there. Devdas’s incorrigible behaviour continues, however, and finally his strict father decides that his son should spend the rest of his youth in Calcutta, where he can learn some more discipline. Now Paro is alone, and she is consoled by a pair of wandering Baul performers who sing to her a song about the legendary romantic pair, Krishna and Radha (Radha expresses sadness in the song, because she misses Krishna). 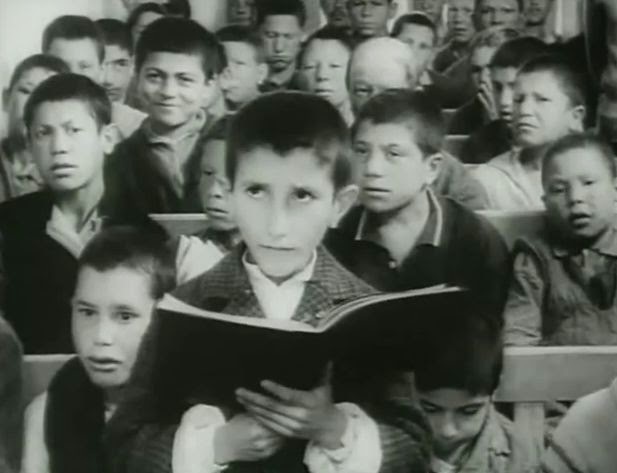 There are several “familiar images” in this film – this is a well-known cinematic technique in which contextual settings that are returned to repeatedly have a cumulative psychological effect on the narrative experience. One of these is the stone stairway leading down to the river bank where Paro goes to fetch water. Another familiar image is the external stairway leading down from Paro’s upstairs room of her family home. On numerous occasions she is seen rushing up or down those stairs during moments of emotional stress. 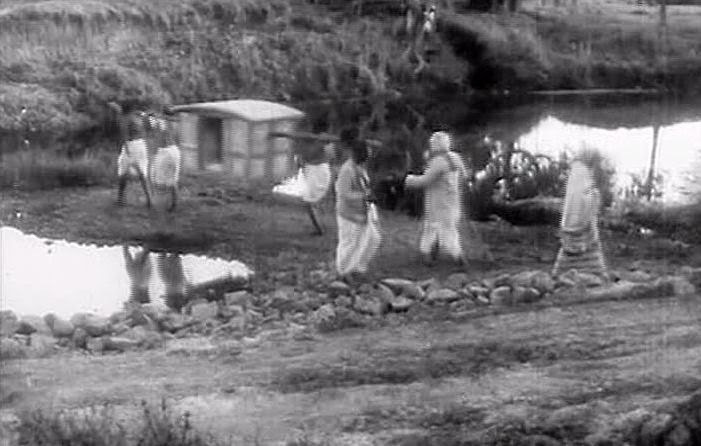 Anyway, it is now about ten years after Devdas had left for Calcutta (at the end of “Act 1"), and a grown-up and beauteous Paro (played by Suchitra Sen) is seen fetching water at the familiar image river bank. Her friend comes to tell her that Devdas (Dilip Kumar) has returned – “with a cane in his hand, a watch on his wrist, and a gold buttons chain. He has become a real gentleman!” From Paro’s breathless reaction, it is evident that she has been pining for him. Paro is now of marriageable age, and with Devdas back in town, Paro’s mother approaches Devdas’s mother in the traditional fashion to propose a marriage between the two (Devdas and Paro are not part of this interaction). But the Mukherjee family, being wealthier and supposedly of a higher subcaste, rejects the proposal. Paro’s father is personally affronted by this rejection and angrily vows to marry Paro off to an even wealthier man. In no time he finds his candidate for Paro – a wealthy older widower from the village of Manepur with some grownup children. Desperately in love with Devdas, Paro decides to take matters into her own hands and do what is basically unthinkable for a respectable woman in a conservative society. In the middle of night, she sneaks over to the Mukherjee household and goes to Devdas’s room, where she begs him to marry her. Hoping that he will stand up to his parents’s objections and insist on marrying her, she basically throws herself at his feet. But Devdas, no longer the headstrong youth seen in Act 1, seems diffident and helpless. He worries that Paro’s defiant action will create a scandal. “Why did you do this?”, he timidly asks, “won’t our heads hang in shame tomorrow?” His unresponsiveness at this critical moment is something that he will long regret. Devdas does go to his family the next day and meekly asks for permission to marry Paro, but his father threatens to disown him for such impertinence. Angry with this reaction, Devdas abruptly returns to Calcutta without saying goodbye to Paro. "It has never crossed my mind that I desire you." "It has never occurred to me that I desire you." Devdas is saying that he has never, ever had any desire for Paro. Devdas is saying that he had not realised before what he now knows to be true – that, deep down inside, he really does love her. After posting the letter, Devdas’s conscience scolds him, and he rushes back to his home town to intercept the letter before it is delivered, but he is too late. Paro reads the letter and clearly gives it the first of the two above-mentioned interpretations. Devdas goes down to the (familiar image) river bank hoping to meet Paro, where she is fetching water, but she gives him the cold shoulder. In response, Devdas, echoing his earlier teenage outburst of anger, savagely beats her across the face with a long stick, giving her a permanent scar on her forehead. Though he then repentantly attends to her wounds, he clearly acknowledges that they will be going their separate ways. This is the decisive split that takes place only one-third of the way through the story. Devdas returns to Calcutta, while Paro prepares for her upcoming arranged wedding to the older gentleman. While she waits, Paro is serenaded by the Baul duo again with another enchanting song about marriage. Back in Calcutta, Devdas carouses with his worldly and dissolute friend Chunnilal, who invites him to join him in drinking alcohol and visiting an upscale club that features exotic dancers (nautch girls) offering their “services”. 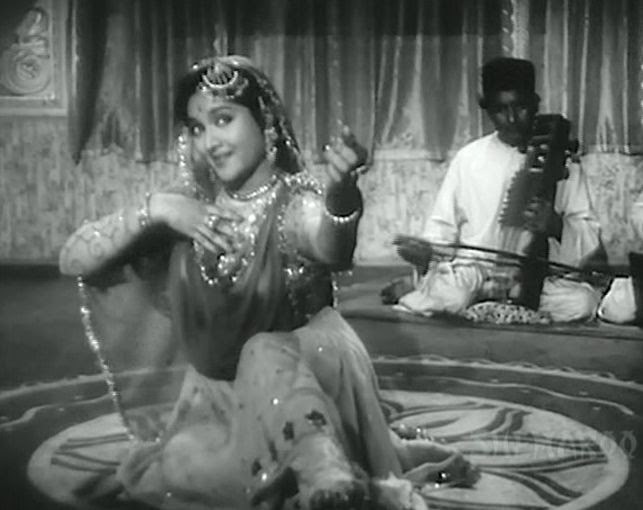 The main dancer is Chandramukhi (Vyjayanthimala), and she seductively serenades him with a song and dance presenting the irresistible offer, ”I Leave it to You”. One of those in attendance is an inebriated Chandramukhi patron (played by Johnny Walker), whose presence in the film is clearly for comic relief . 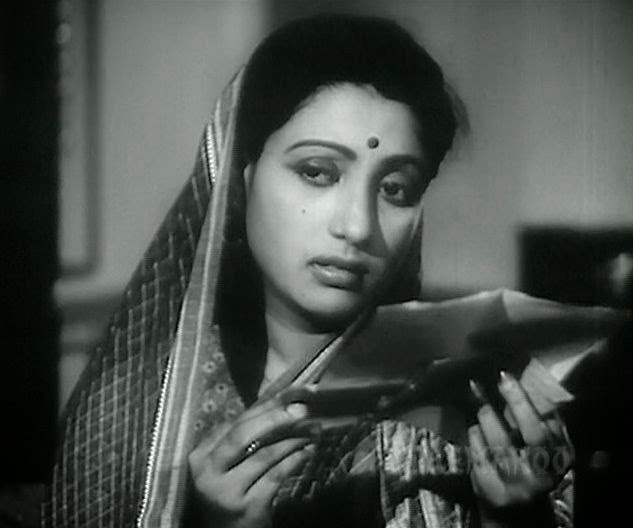 Now without her previous steady income, Chandramukhi leaves Calcutta to go live in a provincial dwelling (that turns out to be owned by the Mukherjee family). But when she hears that Devdas’s heavy drinking is killing him, she rushes back to Calcutta and finds the drunken Devdas lying in a gutter. When he is taken back to her hotel room, she expresses her continuing love by singing and dancing for him once more. The next morning, though, Devdas collapses, and a doctor informs him that he must get away from the temptations of the big city and leave town before the alcohol kills him. Before leaving, Chandramukhi asks him to promise not to drink, but once more he says he can’t make that promise. So Devdas takes off on an aimless train trip across India. Unfortunately, but perhaps predictably, he happens to encounter his old pal Chunnilal, who promptly tempts him with alcohol. This, of course, leads to the final ruination of the self-destructive Devdas. Now dying, he attempts to go make one final trip to Manepur to see Paro, but he passes away just outside the gate of her estate before she can see him for the last time. In fact tn this respect, I have often encountered expressions of the view that the entire Indian culture was emasculated by Western (specifically British) imperialism. But I don’t agree. In my opinion, the subtleties of India’s rich and philosophically deep culture are far more complex than can be encompassed by such simplistic schematizations primarily based only on relatively recent (from the broad historical perspective) state-level operations. No, what makes Devdas linger in the minds of the public is its expression of romantic longing. This film is fundamentally about love and how deeply it can affect people, even though they (particularly men) may not discuss these matters explicitly with others. And this presentation is enhanced in the film by both the cinematography of Kamal Bose and the music of Sachin Dev Burman. These two go together, because the musical pieces are particularly well staged by Bose’s camera work. The musical pieces, particularly those associated with the enamored courtesan Chandramukhi, are infused with sweetly passionate yearning for the beloved. This brings me to the topic of the three main characters – Devdas, Paro, and Chandramukhi – and how they are characterised by the actors who perform the roles. Certainly, one would assume that the main character, the primary center of focalisation, is Devdas, and so the story is really about him. 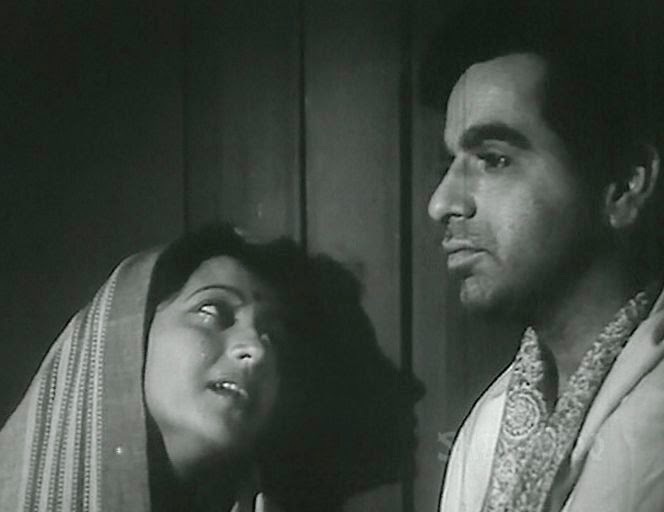 But I would say that the performance of Dilip Kumar in this role is so weak as to almost undermine the whole film. (Note that “Act 1" of the film, showing a teenage Devdas not played by Kumar, is full of vitality and quite different from the mournful despondency established by Kumar in the remaining acts.) It is often the case that the modern cinematic antihero is reticent in the face of social turmoil. But Kumar’s listlessness in this film is soporific. When we watch characters played by people like James Dean, Jean-Louis Trintignant, or Robert De Niro, they may often be reticent, but there is some emotive expression displayed. The viewer gets some sense of the unarticulated but internally felt emotions of the characters. With Kumar here, however, we only get enervating indifference. Other antiheros are almost always alert to their circumstances, but Kumar here just seems always to be in a fog. Kumar’s blank performance reduces the character of Devdas to be that of a hopelessly self-pitying narcissist. Of course, we know that Devdas is selfish (we all are to some degree), but the extreme selfishness of Devdas here turns us away from any kind of empathy. He doesn’t seem really to love Paro and want to give himself to her; he merely laments the fact that he couldn’t possess her. This is the way this idle patrician (he doesn't work; he merely lives off the landlord-collected rents) is with everything. His unrelenting self-obsession made him similarly incapable of responding to Chandramukhi and seeing her as a person. The fact that he is always clean-shaven and his hair is always similarly coiffed, no matter how degenerate he has become, is a cinematic flaw in cosmetics that only further contributes to his blank-slate persona. A much better presentation of this kind of character is Guru Dutt’s portrayal in his variant of the Devdas theme, Kaagaz Ke Phool. On the other hand, the characters of Paro and Chandramukhi are almost pure embodiments of selfless love. 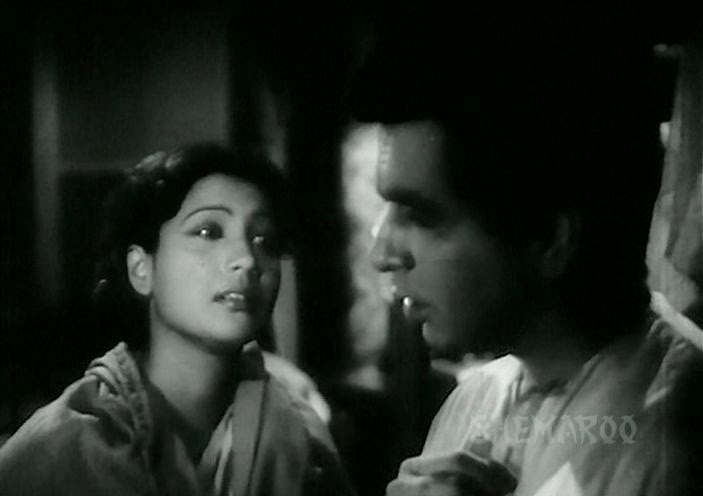 The passionate expressions of Suchitra Sen (Paro) and Vyjayanthimala (Chandramukhi) convey all the unfulfilled longings that are absent from Kumar’s expressions. Interestingly, these actresses are not slender nymphs connoting some ethereal affection, but full-figured young women whose expressions and gestures suggest loving physical engagement. They never meet each other in this story (and hence do not know what each other looks like), but on one occasion they happen to pass each other and exchange unknowing gazes while they are heading in opposite directions along the road. Their performances invigorate the film and help sustain interest in the Devdas decline (the final two-thirds of the film) to such a degree that we could say the film is at least as much about them as it is about Devdas. In the end what redeems this Devdas is the music, the cinematography, and the emotive performances of Suchitra Sen and Vyjayanthimala. 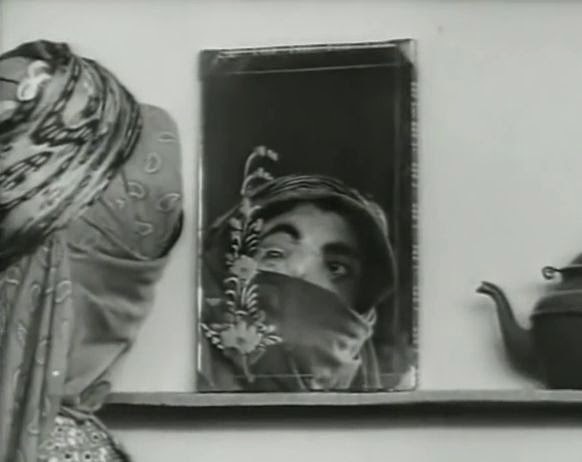 But a more involving and nuanced cinematic expression of these general themes is presented in Guru Dutt’s Kaagaz Ke Phool, made a few years later. 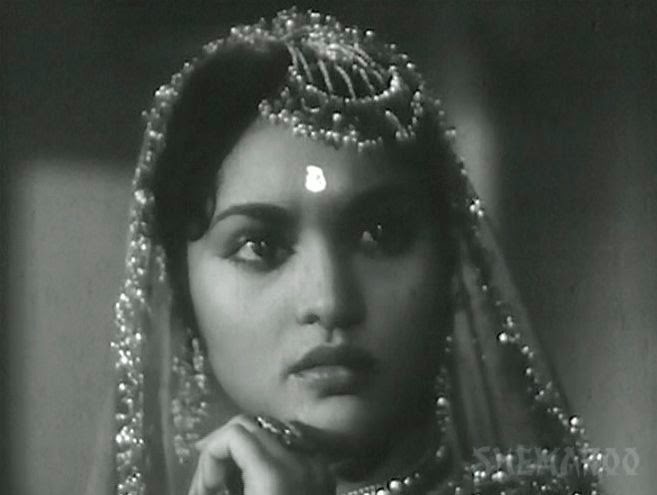 Poonam Arora, “Devdas: India's Emasculated Hero, Sado-Masochism and Colonialism”, (1997), Jouvert, a Journal of Pre-colonial Studies, ISSN 1098-6944, North Carolina State University. Johnny Walker had a similar role in Kaagaz Ke Phool.